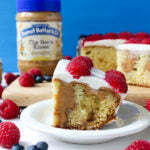 Summer gives us lots of reasons to feel patriotic, so why not show it with a delicious Peanut Butter Poke Flag Cake! 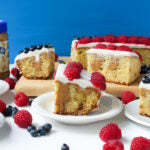 Deceptively easy and insanely fun to prepare, this is a wonderfully tasty cake that can be mastered by any skill level. 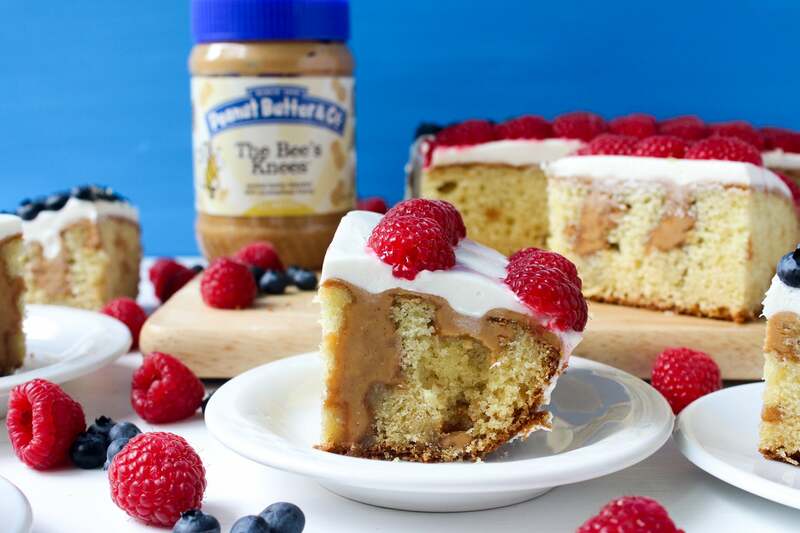 Made with a from-scratch vanilla cake that’s poked with holes and filled with a luscious Bee’s Knees peanut butter filling, it’s an indulgent treat that everyone will be clamoring over. 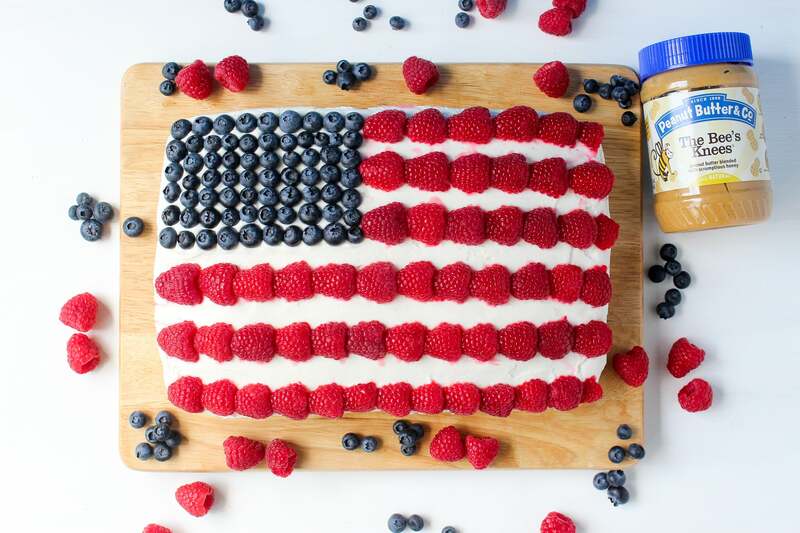 For extra ease frost it with store-bought icing, then cover in blueberries and raspberries in the shape of the American flag! It’s bright, cheery, and delicious, just like all summertime food should be. 1. Pre-heat the oven to 350F. 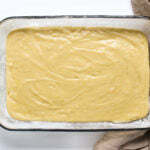 Amply grease a 9” x 11” or 9” x 13” baking pan with shortening, then dust with flour. 2. 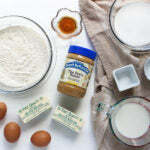 In a mixing bowl combine the flour, baking powder, baking soda, and salt, whisking to combine. Next, in the bowl of a stand mixer add the butter and sugar, then beat on medium speed until light and fluffy, about 5 minutes. Next beat in the eggs, one at a time, until combined. 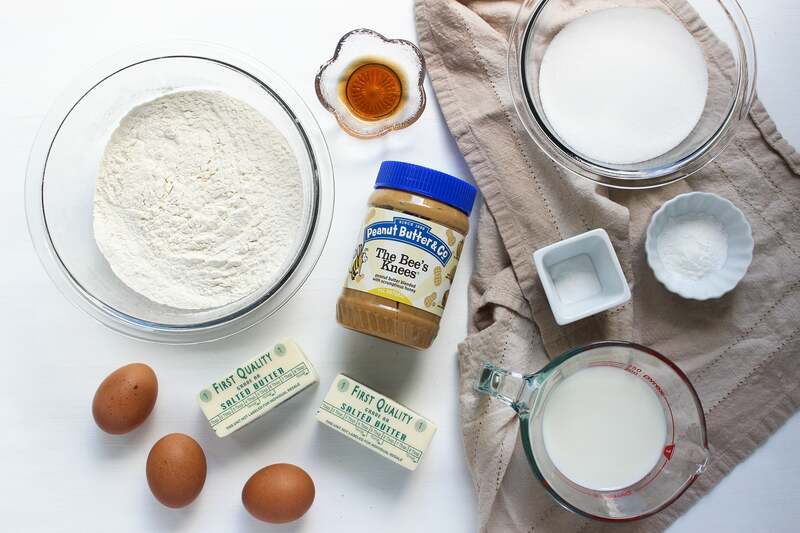 Reduce mixer speed to low, then add the dry ingredients and the milk to the bowl in alternating doses until the batter takes shape. Lastly beat in the vanilla. 3. 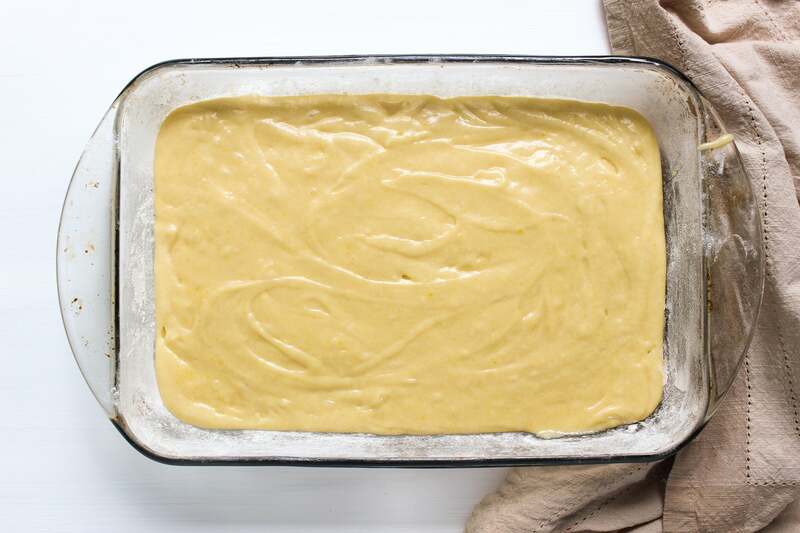 Transfer the cake batter to the greased and floured baking pan, then bake on oven middle rack for 30 – 35 minutes until a toothpick comes out of the center clean. 4. 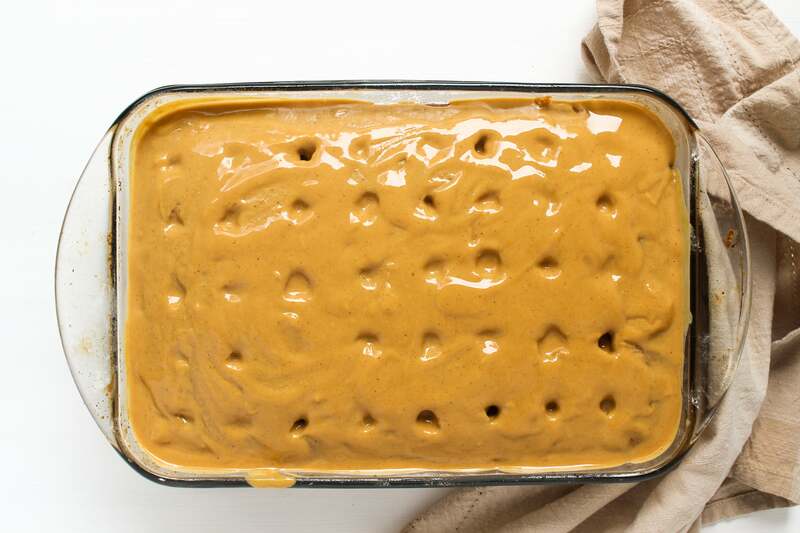 Meanwhile, when there are 5 minutes left for the cake to bake, in a small saucepan melt the peanut butter and butter over low heat. 5. 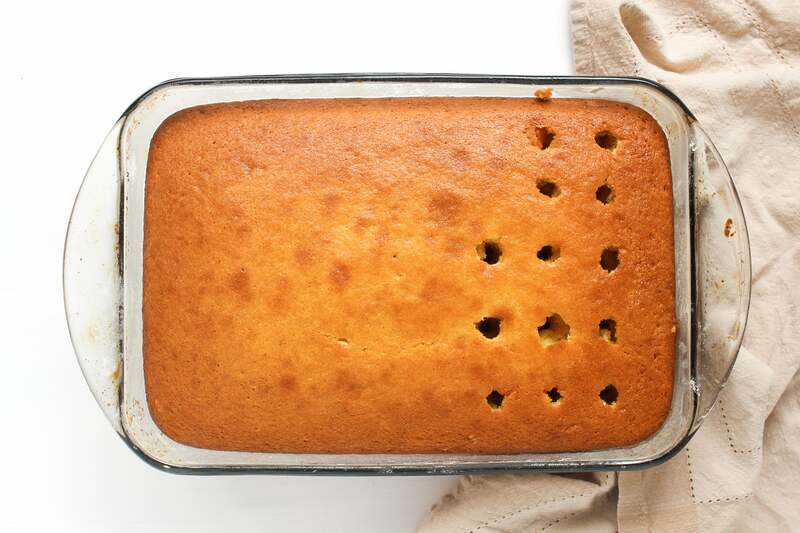 As soon as the cake is out of the oven, poke with large holes – I used a fat straw to make mine! 6. 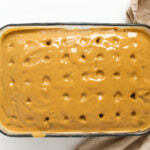 Pour the melted peanut butter into the holes, spreading the excess over the top of the cake. 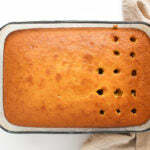 Allow cake to cool at room temperature for 1 hour, then for another 3-4 hours in the refrigerator, uncovered. 7. 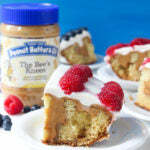 When ready, use a metal spatula to gently remove the cake out of the cake pan, then transfer to a serving plate. 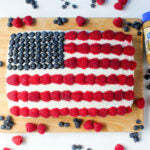 Frost on all sides with vanilla frosting, then arrange the blueberries and raspberries in the shape of the American flag. Enjoy! 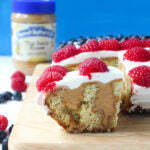 The post Peanut Butter Flag Cake appeared first on - Peanut Butter & Co. Recipe Blog.